Erin and I honeymooned in Anguilla in 2005! We stayed at Cap Juluca and would recommend it to everyone! We were in Villa One which afforded us the privacy we were looking for on our special trip. Our highlights included a "Sunset Cruise" on one of the resorts powerboats, sipping Marlin's Glows on the beach at Maunday's Bay (served by our beach attendant Terrance! ), a day trip to St. Martin and the food! George's reminded us of home with it's special Carribean spices! Everyone is genuinely interested in your comfort and happiness! You can leave your luggage with Speedy at the ferry dock without hesitation or worry. 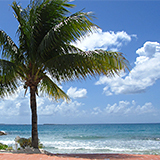 We hope to return soon for more relaxation, more great food and more Anguillian hospitality! Thanks for your website, Nori. It was very useful. 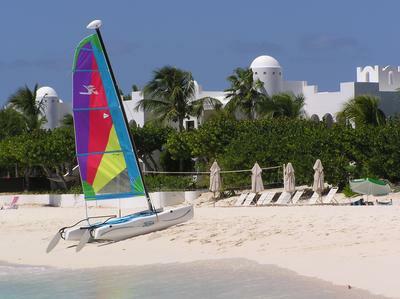 Cap Juluca has long been viewed as the flagship of Anguilla. But with some major hotel/resort developments coming online soon and other more modern resorts like CuisinArt, Cap Juluca is falling behind. Everyone expects either a major local development or a large international brand such as Four Seasons to acquire and bring Cap Juluca back up to its fabled #1 status. It's still a great place to stay, though! Best regards, Nori. Join in and write your own page! It's easy to do. How? 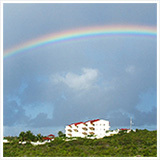 Simply click here to return to Five Star Anguilla Hotel Reviews.